After Sky News’s crackdown on Twitter use – and specifically retweeting non-Sky journalists – was revealed last night, it’s the BBC’s turn to clarify its position. In a post on the BBC editors’ blog today, social media editor Chris Hamilton says the corporation has distributed some revised breaking news guidance to correspondents, reporters and producers. It says that, when they have some breaking news, an exclusive or any kind of urgent update on a story, they must get written copy into our newsroom system as quickly as possible, so that it can be seen and shared by everyone – both the news desks which deploy our staff and resources (like TV trucks) as well as television, radio and online production teams. We’ve been clear that our first priority remains ensuring that important information reaches BBC colleagues, and thus all our audiences, as quickly as possible – and certainly not after it reaches Twitter. This entry was posted in Editors' pick, Journalism, Online Journalism and tagged BBC, chris hamilton, Twitter on February 8, 2012 by Paul McNally. Sky News Twitter restrictions – where do you stand? I’m told #SkyNews have stopped their journos retweeting information/tweets from journalists or people not working for Sky. Must be wrong?? Don’t tweet when it’s someone else’s story. Stick to your own beat. Always pass breaking news lines to the news desk before posting them on social media networks. Sky News battening down hatches on this one. 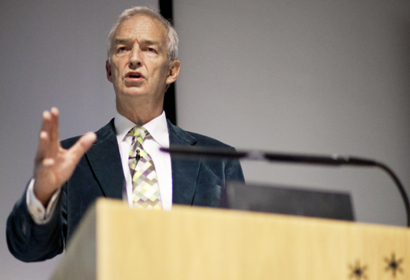 Told new guidelines are non-negotiable – how long will they last?? A hashtag campaign soon got under way to #savefieldproducer – Sky’s popular digital news editor Neal Mann, who has more than 40,000 followers on Twitter. Just as you never get good search-engine optimisation if you don’t link to outside sites, so anyone who steadfastly refuses to be anything but a puff factory for their own brand will gradually loses friends. This step will also be likely to offer a competitive advantage to other news sources, such as ITV News or the BBC, enlightened enough to see beyond the blinkers of brand identity. The ban on RTs makes sense if you acknowledge their worry that disputed links or info by their journalists could reflect on Sky News itself. Is it any surprise editors at Sky News feel that a RT not meant as an endorsement could be interpreted in that way anyway? After all, people still attack me for publishing editorials on LC even if I disagree with those views. Once a Twitter mob gets going it’s very difficult to calm it down. Of course this also implies Sky News editors don’t want to give their own journalists too much leeway in using their judgement. But all the broadcasters have hefty rule books for journalists (I expect the BBC will follow Sky), so this isn’t that surprising. 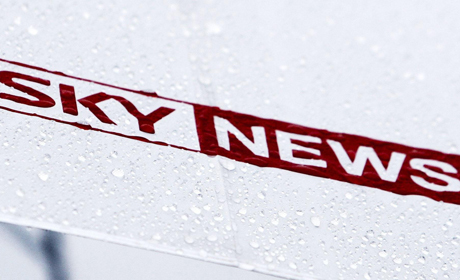 It makes no sense for Sky News to pay journalists to break stories through another medium. It makes no sense for them to pay journalists to amass personal social media followings by promoting rival news outlets. And it makes no sense for them to pay journalists to report through a medium outside its own editorial controls. Sky News has the same editorial procedures across all their platforms including social media to ensure the news we report is accurate. I have nothing to do with Sky NewsWhat do you make of the new policy? Is it enforceable? What effect might it have on Sky’s reputation? Gabrielle Laine Peters has put together an excellent Storify of tweets and opinion around the Sky directive. Here is her collated selection called Sky News new social media guidelines get Twitter buzzing. Elana Zak has also used Storify to collage reactions. This entry was posted in Journalism, Online Journalism and tagged Sky News, social media, Twitter on February 8, 2012 by Paul McNally. 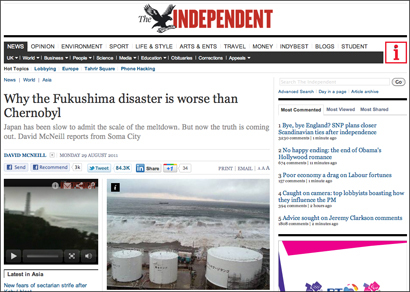 This is essential reading for anyone who embeds tweets into a news story or blog post. Twitter now has an “embed this tweet” option on all tweets. In the new Twitter, simply find the tweet you want to embed, click Twitter name (e.g. 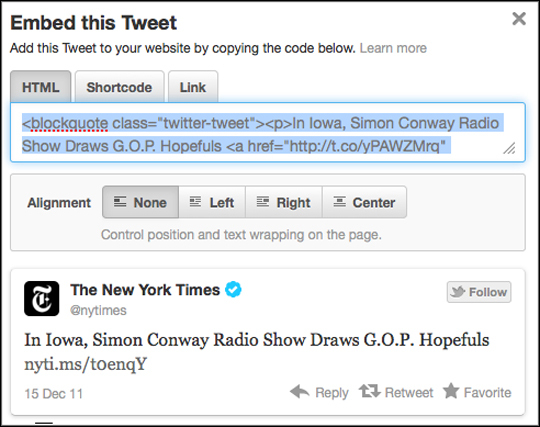 The Stream or The New York Times) on the individual tweet, then “details” and click “embed this tweet” and copy and paste the code. This replaces the need to use Twitter’s (buggy) Blackbird Pie tool or a plugin such as Embedly. Hat tip: 10,000 Words and Adam Tinworth on One Man and his Blog. This entry was posted in Handy tools and technology, Social media and blogging and tagged embed, Twitter on December 15, 2011 by Sarah Marshall. After taking a look at the top 10 Facebook news stories of 2011 yesterday, today we are publishing a list of the year’s top Twitter stories. This list is based on data from SEO and social data tool Searchmetrics. A liveblog makes it in at number two, plus there are photo stories and a news game (see number four). Data was gathered using Searchmetrics and downloaded for analysis on 6 December. The news outlets included were: BBC, Guardian, Telegraph, Independent, Mail Online, the Sun, the Mirror. You can see the downloaded Twitter data here. This entry was posted in Social media and blogging, Traffic and tagged BBC, Independent, Mail Online, searchmetrics, The Guardian, Twitter on December 8, 2011 by Sarah Marshall. How is it of use to journalists? How many of your followers saw the last tweet you sent? As Twitter is a scattergun approach to sharing news, it is likely that most followers will have missed it. 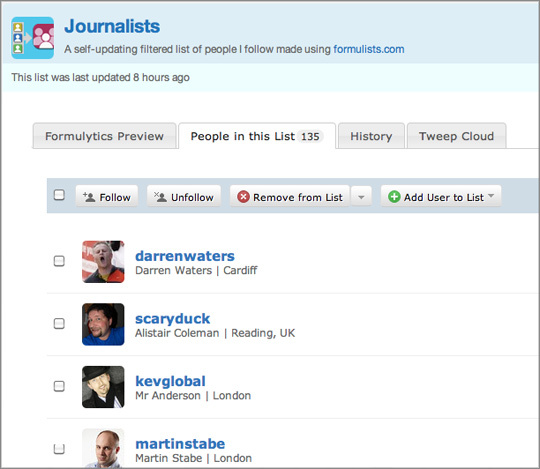 Buffer is a tool that allows you to schedule tweets, posting them at selected intervals throughout the day. 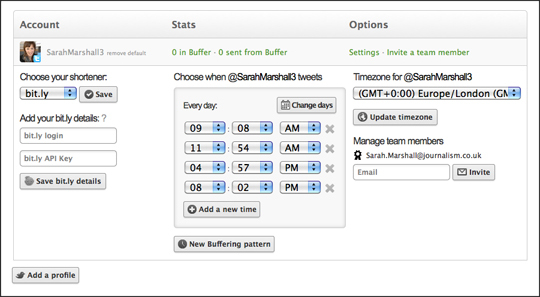 You can select Buffer’s suggested tweet times, which are based on research, or you can choose your own times. 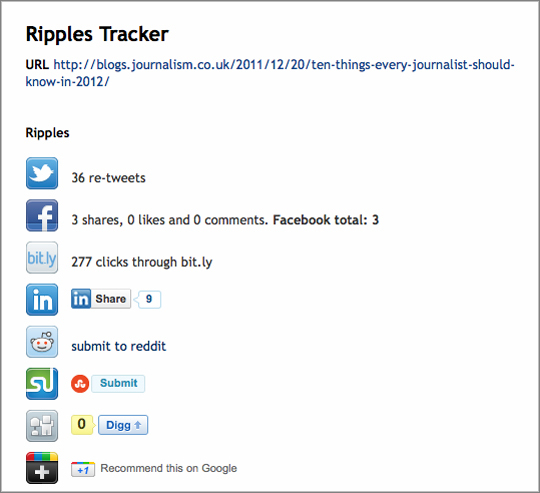 Buffer could be helpful to news organisations who want to post a story, such as a feature or blog post, several times. It could also help in crowdsourcing, tweeting a request more than once. According to Buffer co-founder Leo Widrich, who spoke to Journalism.co.uk and is quoted in this guide on how to: best post news on Twitter and Facebook, news organisations should tweet each story three to five times: for example once when the news story goes live, once a couple of hours later and then a third time the next day. That’s very much a use case of why we built Buffer, but this is what we do for our news stories and blog posts. We drop all the stories we have into our buffer and they get well spaced out over the day and get posted so that we always have a different audience that will be able to see the tweet. 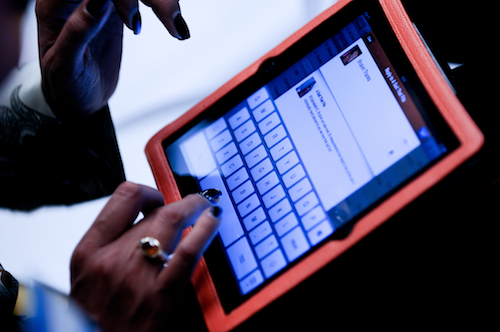 There will be a session on social media optimisation and how to best time tweets and Facebook posts at Journalism.co.uk’s news:rewired – media in motion conference for journalists. The news:rewired agenda is at this link. This entry was posted in Social media and blogging, Tool of the Week and tagged buffer, leo widrich, social media optimisation, Twitter on December 6, 2011 by Sarah Marshall.